Choosing the perfect walk-behind mower is easy once you know which kind best suits your yard. Some people think of a reel lawn mower as an antique tool, a relic seen only in movies and cartoons from the 1950s. We beg to differ. 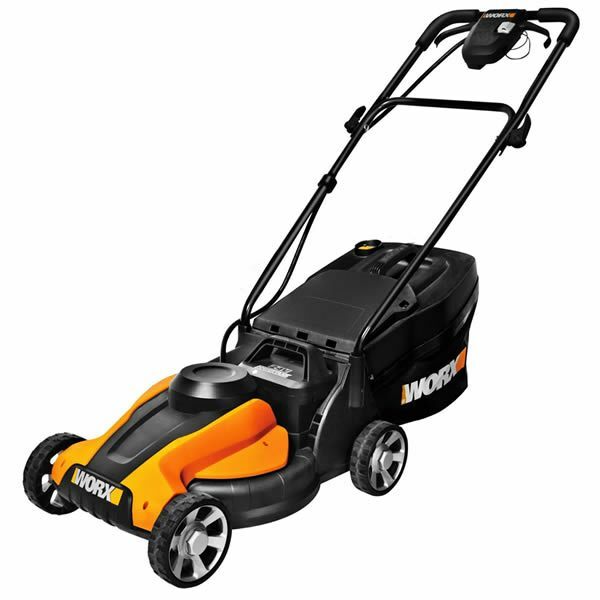 Using a reel of blades that spins as you push, reel mowers avoid tearing the grass the way that rotary motor blades do. Instead, they trim grass with a fine cut the way that a pair of scissors would... if you could attach a set of wheels to a pair of scissors and push it across your entire lawn. Reel mowers can get jammed by twigs and debris, making them a less-than-ideal choice if your yard has lots of trees. 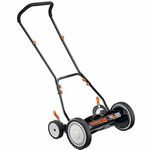 However, manual reel mowers are ideal for smaller lawns or those who mow more frequently and aren't concerned with cutting long grass. Powered reel mowers often prove to be on par with (or even better than) other types of walk-behind mowers. 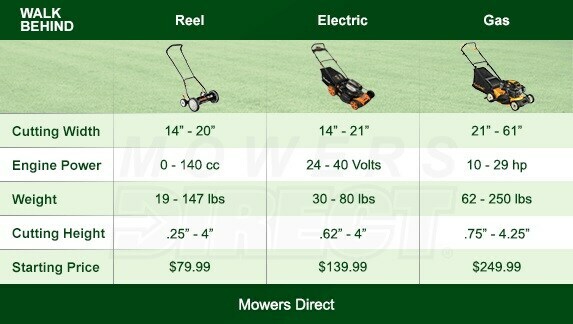 Electric mowers have become more popular as gas prices have continued to fluctuate. They're available in two styles: corded mowers and cordless or battery-powered mowers. You can't venture far from an electrical source with a corded electric mower. 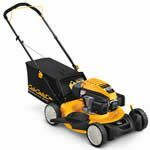 The limited amount of charge that a battery can hold also means that cordless electric mowers might not be the best choice for large lawns. However, if you're interested in a walk-behind mower that costs less than a gas mower and provides some power without burning through fuel or needing regular oil changes, an electric mower is an excellent choice. Walk-behind gas-powered mowers remain the most popular lawn mower option. You can find them in two styles: push mowers, which require effort from the user to move forward, and self-propelled mowers, which use a drive wheel to move forward so that a user simply guides the mower around the yard. So why are gas-powered mowers so popular? One simple reason: their power. Their engines allow them to cut thick grass with ease. The powered drive wheels on self-propelled mowers also make them the best choice for mowing hilly lawns with noticeable inclines. If you have a mid-sized or large lawn with a lot of thick, overgrown grass to tame, or if you like the convenience of a drive wheel making your mower easier to push, your best bet in a walk-behind mower will be to go gas-powered. Walk-Behind Lawn Mower Buyer's Guide.. Our Power Equipment Direct how-to library can help you learn about How to Fertilize Your Lawn, Vote for Your Favorite Brands in Mower Madness 2019 and Official Mower Madness Contest Rules.